From the Malay word Kakatua, meaning “greater sister” or “old sister”, the Cockatoo is a name that has been used in English and, with some modification of spelling, in European countries for more than 300 years. Undoubtedly the name has been taken from the cry of one or other of the well-known birds so called, though it would be impossible to say which of them. The Cockatoos are peculiar to the areas around the Australian Region, including Tasmania and New Guinea as well as in Indonesia. They also naturally live Eastward as far as the Solomon Islands. Picture of Wild Cockatoos Feeding They are very similar to the parrots in their hooked bill which has considerable strength and could even kill larger mammals. Another similarity is their zygodactyl feet (two toes forward and two pointing back). With these feet they can grab food and othet items with quite a hold . As a distictive characteristic, cockatoos have a moveable crest, and plumage of generally simpler colors. The plumage is white, black, grey or pink colored, with some kinds even possessing smaller yellow or red patches or areas. 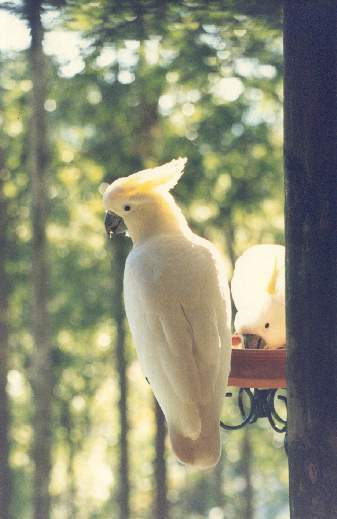 A further distinction is the Cockatoo's possession of a Gall bladder. Cacatuinae containing the all the species ordinarily called Cockatoos and kept as pets, which are commonly white with yellow, or pink crests. Calyptorhynchinae within which the Calyptorhynchus genus contains the large black species of Australia, with a long tail banded with scarlet, yellow or cream-colour. Nymphicinae consisting of one genus, Nymphicus. The Nymphicus genus itself contains one species, the Nymphicus hollandicus more commonly known as the Cockatiel. Microglossinae comprising the one genus, Probosciger, which itself contains a single genus, Probosciger aterrimus, this being the Palm Cockatoo, one of the largest birds to be found in the family. This impressive bird has a large crest and wholly black plumage which is relieved by its bare cheeks of bright red. The Palm cockatoo uses tools in the way that it knocks with a nut or a cut branch on the bark of dead tree-trunks. In this way it produces a noise which is audible at a distance of up to 100m. It is thought that this may serve to indicate its presence to its partner as well as to passing intruders. Within these 4 subfamilies there are a total of around 20 species of cockatoo. They reside in very differing environments. Their habitat varies from the dry savannahs inside Australia to the tropical rain forests in Indonesia and on the Philippines. The food consists predominantly of fruits and seeds. The Long-billed Corella, (Cacatua tenuirostris) eats roots among its diet as well. Outside of the breeding season the Cockatoo lives in small informal groups or in large flocks of several hundred birds. In Australia some farmers consider the cockatoo to be a parasite, as flocks can swarm through grain fields. Most Cockatoos have a very loud voice. They can call out quite different noises out, from sqawks and cries to whistles, and also copy sounds like ringing telephones or the human voice. They are however not as talented in language as the grey parrot. Similar to other parrots, Cockatoos can grow to a very old age. In London zoo a Sulphur crested Cockatoo reached the ripe old age of 82 years.